If you are about to leave the Regular Service (RN or RM) or have already left, you can put your experience to good use as a Careers Adviser (CA). Providing advice and counselling to candidates considering careers in the Naval Service. Recruiting candidates by nurturing, conducting the interviews, administering selection tests and eligibility checks required by the recruitment process. Completing the documentation and processes to ensure candidates’ timely arrival at the Training Establishments. 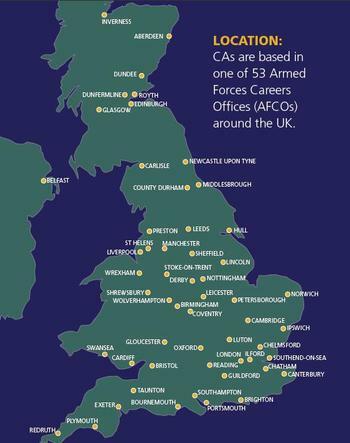 Establishing and maintaining close liaison with civilian employment staffs, careers counsellors in schools, youth training organisations and community leaders in order to represent the Naval Service wherever possible. Accompanying students on acquaint courses and visits. Attending careers conventions and other events associated with recruiting. All CAs attend a comprehensive five week training course at Royal Navy School of Recruiting (RNSR) at Bovington. The course syllabus includes theoretical and practical training in the recruiting tests, interviewing techniques, the selection interview process, report writing, administrative requirements, the computer record system TAFMIS, as well as practical acquaint visits to HMS Sultan, Collingwood, Nelson and Navy Recruiting Headquarters in Portsmouth. Personnel currently join the NCS on Full Time Reserve Service (Limited Commitment) (FTRS) which involves leaving the Regular Service and joining the Royal Fleet Reserve.